On a clear and windy night, at the dead end of a street in Seattle’s bustling Capitol Hill neighborhood, an apartment building overlooks Highway 5. Cars in countless lanes going multiple directions are persistent and loud, and the city’s skyscrapers across the highway glitter and wink. 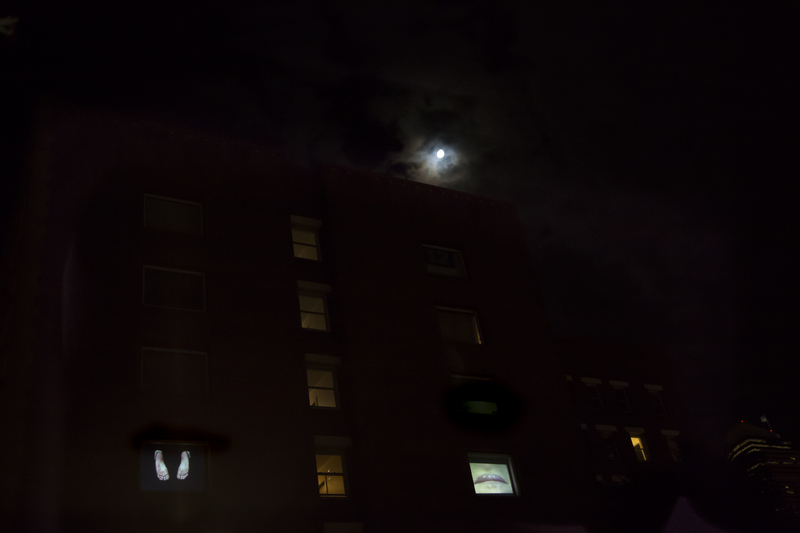 Two large windows in the apartment building, three floors up, have become temporary capsules for very vulnerable human images, projected as if part of the building’s own consciousness. One film shows a nervous nail biter—then the bottom of the feet of a person who is kneeling—then closed, lightly fluttering eyes. The other cycles between fists beating in a ritual-like pattern (angry but focused), a closed mouth refusing water being poured over it, and open arms down which rivulets of water flow. This is “Unfolding,” a one night, site-specific, multiple channel video installation by Erin Elyse Burns. The images projected high above the parking lot where viewers stand have a stilling and meditative effect. The magic of seeing human details projected this large in an unexpected place puts me in mind of drive-in movies, where, when seen from a distance, epic faces in close-up silently entreat one another against the black of night. But Burns’ images are more closely related in form to Ann Hamilton videos or seminal video artist Bill Viola’s. These artists’ videos, like Burns’, tend to be slow and essential. They use the moving image as a contemplative tool. On the night that “Unfolding” is screened, the country has very recently received the news of the election of Trump to the presidency. Seattle has already been flooded with protests and the mood of the city is raw and open. Friends who see one another at this event embrace with a greater tenderness, buoyed up to be with one another, and to be witnessing a work that so elegantly describes the complex psychology of the struggle for peace and stillness. It strikes me that the imagery you have included circles around nervousness, self-soothing and ritual. Can you speak to these themes? Am I missing other elements? Or misreading? Unfolding might not offer this content to all viewers, but I believe a sense of surrender comes across as well. The imagery cycles through contrasts – dichotomies of stillness and anxiety. Quietude butted up against implied violence. Seductively slow imagery that is at once sensuous and disturbing. I think of these moments as complementary pairs, which is heightened by the diptych display of the work at Vignettes. It is safe to say that the results of the election that occurred a couple days before your one-night exhibition had a profound effect on the viewers’ read of “Unfolding.” Did the piece change for you when placed unwittingly into this political context? Agreed – that reading was very palpable the night of the exhibition. I don’t think the work changed for me because of the election, but I think the mood of our arts community because of collective sorrow, grief, and anguish might have allowed people to connect more fully, more openly, with imagery that in optimistic times could’ve been more alarming or harder to connect with. It seemed like people were relieved to witness this imagery because it expressed things a lot of folks were feeling. I also think the anonymity of Vignettes Marquee openings allows viewers more space to process, and less social pressure. We’re standing outside with open air, and you can easily interact or not, without the mood of a typical gallery. This invites people in differently. While editing footage of the nail biting, I couldn’t help but see how grotesque this habit is – it’s both anxiety inducing and relieving – and I heard that it was disgusting from viewers, but I was also told it was a comfort to see that footage – that is was a natural response to horrific times. This surprised me. It’s also true that there are political impulses behind the work that became louder on Nov. 9th. The footage you described as “angry but focused” pounding of fists surfaced from the deep despair and anger I often feel in response to current events. Mass shootings, police brutality against people of color, our corrupt political system, climate change, women’s rights, you name it… I started to think of that hopelessness that creeps in and the language that describes associated physical gestures. To throw up one’s hands. To be up in arms. Hands up. I can’t breathe… Aspects of the work came from a need to consider where we place our anger, anger of the body and the mind. How does the temporary nature of a one-night exhibition change the way you prepare, or the way you approach the work? I’m not sure it changed much in the way I worked! I tend to be methodical and at times quite obsessive in my work. And whether a show is up for a night or a month didn’t seem to change those habits. That the work was site specific and designed with private imagery to be viewable in a public way was considered more than how long the work was viewable. The ephemeral nature of the event might have led me to be bolder and more direct, but I also see this as a response to what compelled me to work with Vignettes Marquee. We are so curious of others, and I know I always stare into the illuminated windows of houses as I walk by. It’s this momentary, almost illicit impulse, an invitation to briefly invade someone’s privacy in this harmless way. For me this usually happens in these fleeting instants – walking my neighborhood at night or gazing out while stopped waiting for a traffic light to change. This is what Marquee offers up as a construct, and I really wanted to tap into the potential of that. It gives you permission to intently gaze into bedroom windows in the name of art, and people seemed transfixed. To respond to this impulse, this need, I felt it had to be poignant, vulnerable imagery, that is jarring to look at, yet humanizing and relatable. 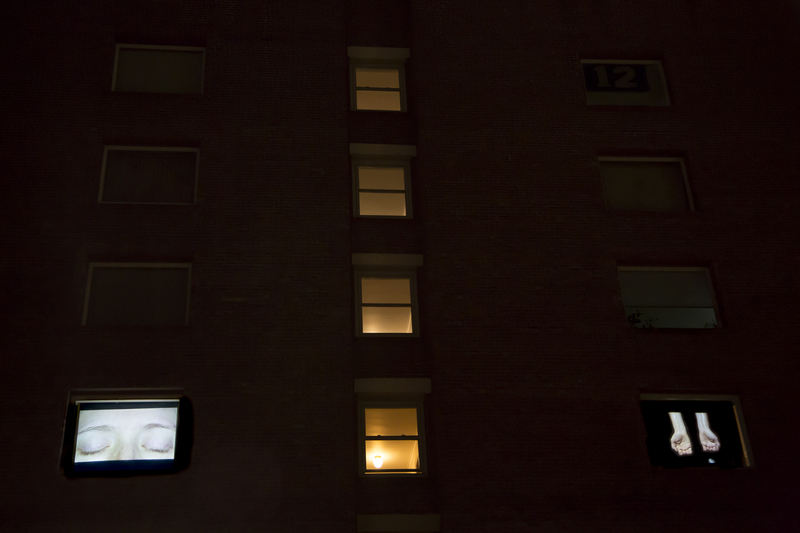 The work asked the viewer to peer into the body of this apartment building. While the limbs depicted are my own, I loved your description of it feeling like the building’s consciousness, because I had hoped that would come across.